We are leading provider of Sales Talent in the Medical Device and B2B Industries. We help our clients build Winning sales teams by attracting the best Millennial Sales Talent in the country. We specialize in bring our customers top performing Sales candidates that will make a difference in driving growth and outperforming competition. We are totally committed to providing you sales candidates that help you improve your top and bottom line growth. We excel in finding the best sales talent that will fit your company culture and drive profitability. Our goal is to become your trusted business partner of choice. We don't simply recruit, we nurture relationships with sales professionals who are looking to excel in their sales careers and aspire to make a difference. We continuously strive to update our recruiting and screening process to deliver Sales candidates that will earn your trust, fit into your culture and deliver outstanding sales results and build long-lasting relationship with the customers. We are experts in building high performance Millennial's Sales Teams. We guide and coach Millennial's in excelling in their Sales Careers and becoming the top performers. We are extremely passionate about the building America Millennial's Sales Force. 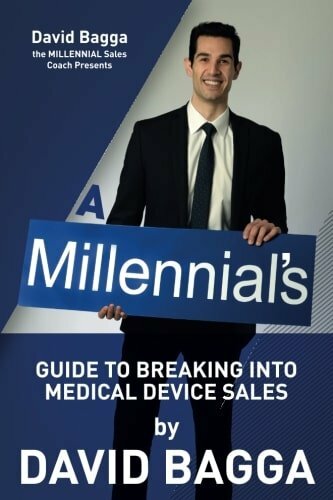 We have written a best seller book on a "Millennial's Guide to Breaking into Medical Devices Sales" to help Millennial's become strong sales performers in the Life Sciences Industry. We are committed to the life Sciences and are the leading provider of Millennial's Sales Talent to Medical device and Healthcare industry. David Bagga maintains the largest Millennial's network n the country and has been a leading speaker at the Medical Conferences where he shared his expertise in successfully hiring the best talent for Medical Device and B2B industries. We have deep experience recruiting B2B sales teams in the Medical device and Life Sciences sectors. This knowledge enables us to thoroughly and accurately assess our clients unique sales hiring requirements and develop an effective recruiting strategy to support their Sales Staffing need. Our expertise and knowledge of the Medical Device Industry has enabled us to develop comprehensive assessment techniques in verifying sales track record, background checks cultural and behavior fit. We know exactly what questions to ask, what skills to identify and what competencies to focus to speed up the hiring the process and begin contributing faster to our clients success. Our Fee Structure is extremely competitive. We provide several fees options including Fixed Fees, Volume Discount and Replacement Guarantee Our Flexible approach allow us to support our clients more effectively and provided them high quality candidates at very competitive fees. We have coached and guided Top Tier Millennial candidates in growing their sales careers in the Life Sciences and the Medical Devices Industry. We are the leading provider of Millennial B2B Sales Candidates in the country. Our specialized sales recruiters have an extensive network and are 100% focused on finding the top performing B2B sales professionals. Excellence in everything we do. Aspire to serve and be the Partner of choice for our Customers and Consultants. Delivers the best Staffing & Consulting talent to our clients and provide the enriching careers and growth to our candidates. Operate at the highest level of professionalism, Communicate openly, create an environment for positive change based on collaboration, respect honesty and utmost trust for our clients and candidates. Our success is based on our deep understanding of our clients need. David Bagga company is committed to delivering exceptional service and value. Support Our Candidate in providing the highest caliber Sales Candidates, solutions and outcome based performances.